Last Wednesday was our 15th wedding anniversary. No, this isn’t a cake I made to celebrate. It’s actually the cake I made for my birthday a month ago. But just pretend it’s a sweet little anniversary cake for now. 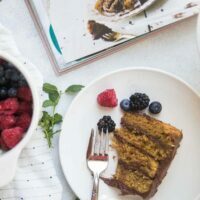 It’s the Classic Yellow Birthday Cake with Milk Chocolate from Sweet Laurel: Recipes for Whole Food Grain Free Desserts — a cookbook I’ve been loving for the past few months. Sweet Laurel is a grain-free bakery located in Southern California that offers baking classes, too. I just adore this book. It’s so…. sweet. Pun intended? Maybe. I love the muted pink hard cover that has a faint cloth-like texture. 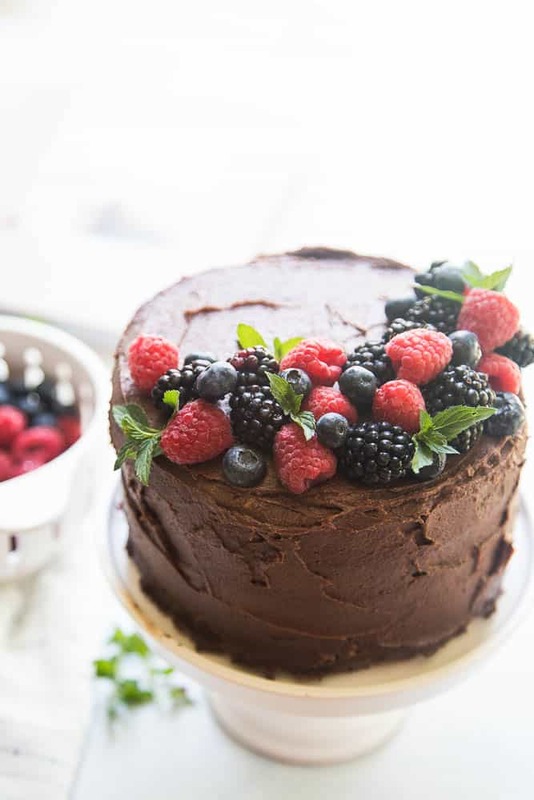 Sometimes it’s tricky to make a grain-free, dairy-free cake look as “special” as regular cakes. Sweet Laurel does such a great job at that and all of these recipes are ones that look like they’re filled with love. I have a very low tolerance for cheesy comments, but I’m serious. From the first time I held the book in my hand and flipped through it, I just felt like this book was something the author poured her heart into. I have a lot of cookbooks, and there aren’t many that give me that feeling. I love Laurel’s signature flower decor on her cakes. And the flowers on the tables. It makes me want to pull flowers out every time I bake something. That wouldn’t be too hard if I could actually keep flowers alive outside. So, this beautiful, delicious birthday— er, anniversary cake…. I was in the mood for something homey and traditional, so I chose this little 6-inch layer yellow cake with dairy-free milk chocolate frosting. 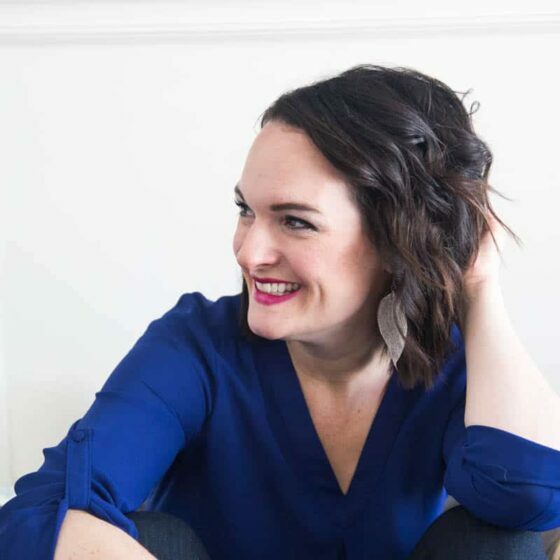 No, the recipes in Sweet Laurel aren’t keto or low carb recipes. They’re all grain-free and dairy-free and naturally sweetened, though. She uses a lot of maple syrup, but you could use a low-carb bulk liquid sweetener like Lakanto Maple-Flavored Sugar-Free Syrup (monk fruit sweetened). Not stevia though, because it’ll affect the texture of the cake too much by reducing the liquid severely. 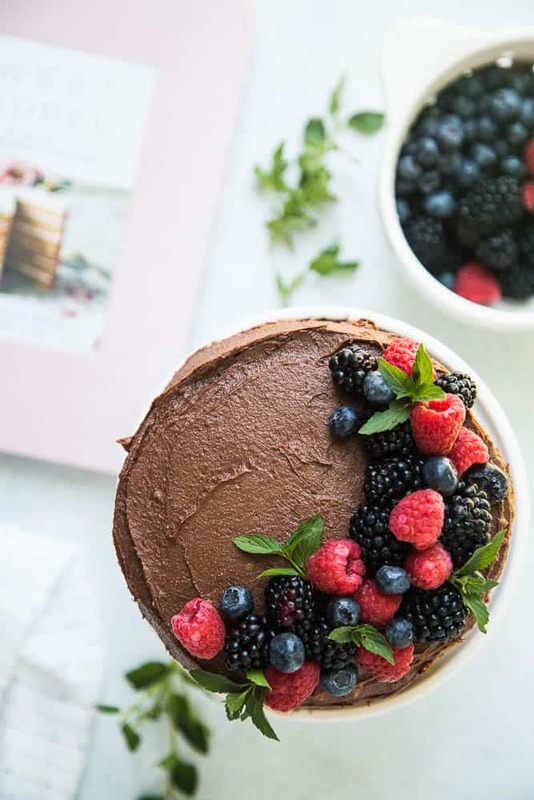 I chose berries and mint sprigs for my cake because as much as I love the look of flowers on a cake, my practical side has a hard time with non-edible decorations. Plus, I didn’t want to go hunt around for flowers. I’m way too indecisive and would have overthought the whole process. I’d like to tweak some and make them low-carb, too, since we’ve been leaning that direction for our desserts lately. I made this cake as-is, though, with the maple, and it was HEAVENLY. The texture of the cake and the frosting was spot on. And I appreciate the petite size — nothing is worse than having leftover cake on the counter day after day, taunting you at breakfast. You can either use one regular 8-inch baking pan for this or two 6-inch baking pans. I use my little pans more than I thought I would — more often for birthday cakes when we’re not throwing a party and don’t want a lot of leftovers. Or when my 11-year-old gets a baking bug and wants to make a cake for no reason. 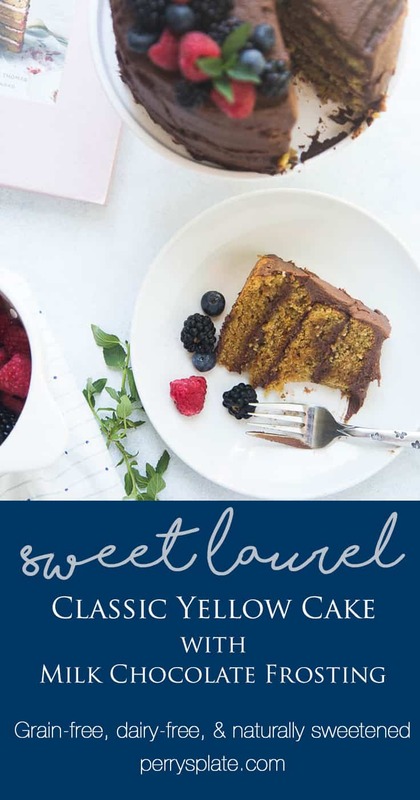 Go grab a copy of the Sweet Laurel Cookbook and let me know what you think! Preheat the oven to 350 degrees F. Line two 6-inch cake pans or one 8-inch cake pan with parchment paper rounds, then grease the sides of the pans with coconut oil. In a large bowl, whisk together the eggs and yolk, coconut oil, maple syrup, and vanilla until well incorporated. In a medium bowl, whisk the flour, salt, turmeric, and baking soda until there are no clumps. Add the dry ingredients to the wet, stirring until a batter forms. Using a spatula, scoop the batter into the prepared pans and smooth out the tops. Bake for 35-40 minutes, or until the cakes are golden brown and a toothpick inserted into the center comes out clean. Allow the cakes to cool completely before removing from the pan. 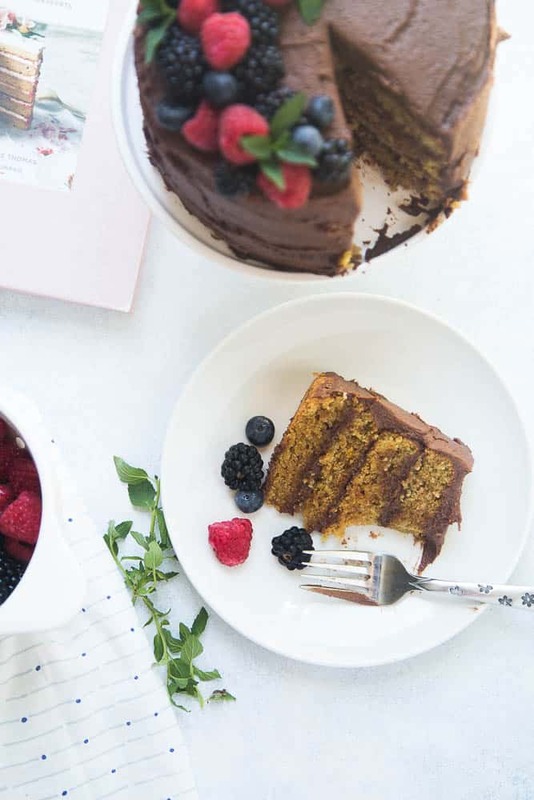 You can leave the cake in two layers or slice each layer in half horizontally, creating four (which we prefer, to maximize the cake-to-frosting ratio). 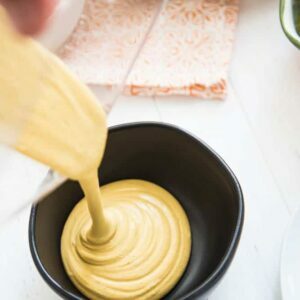 To save for later, wrap each cake layer in plastic and refrigerate for up to 3 days, any longer and the turmeric might turn dark red as it oxidizes. Melt the chocolate and coconut oil in a double broiler over medium heat, stirring constantly. (Or a heat-proof bowl that nests in a pan with 1-inch of simmering water on the stove.) Remove from the heat when melted. Add the maple syrup and vanilla stir to incorporate. Cool to room temperature; it should still be liquid, not solid. Transfer the mixture to a medium bowl (or use the same bowl as before) and with an electric mixer beat in the almond butter until a thick, whippy frosting is formed. Add the coconut milk and continue beating until smooth. Put the frosting in the fridge to set for at least 2 hours. Whip again until spreadable and fluffy, adding coconut milk if you need to smooth it out further. You can store this in a refrigerated container for up to 2 weeks. For decorating four layers, place one layer on a cake plate and top with 1/4 cup of the frosting. Add the next cake layer, top with another 1/4 cup frosting, and smooth. 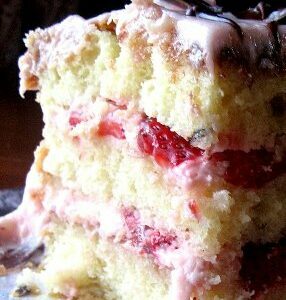 Repeat for all of the layers, then coat the cake with the remaining 1 cup frosting, smoothing it evenly all over. For an 8-inch cake, you can cover the entire cake with the frosting. Garnish with flower, berries, or leave it plain. Refrigerate until ready to serve. 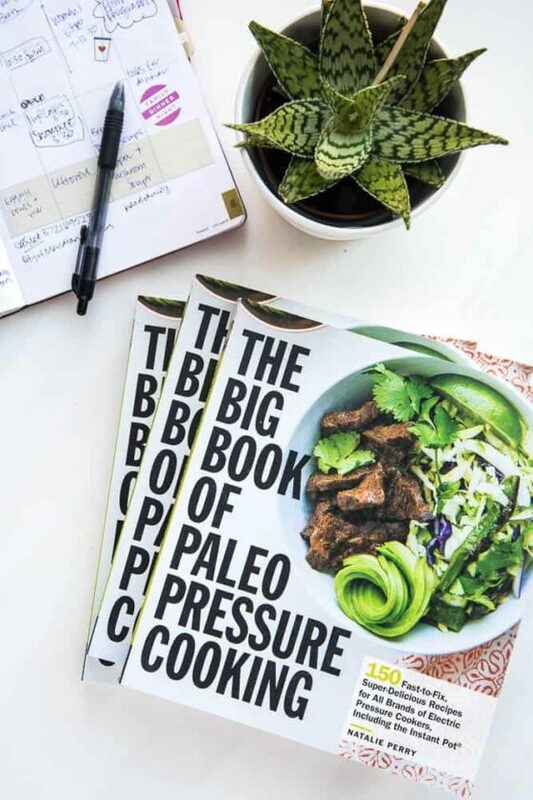 That cookbook sounds like a true gem! 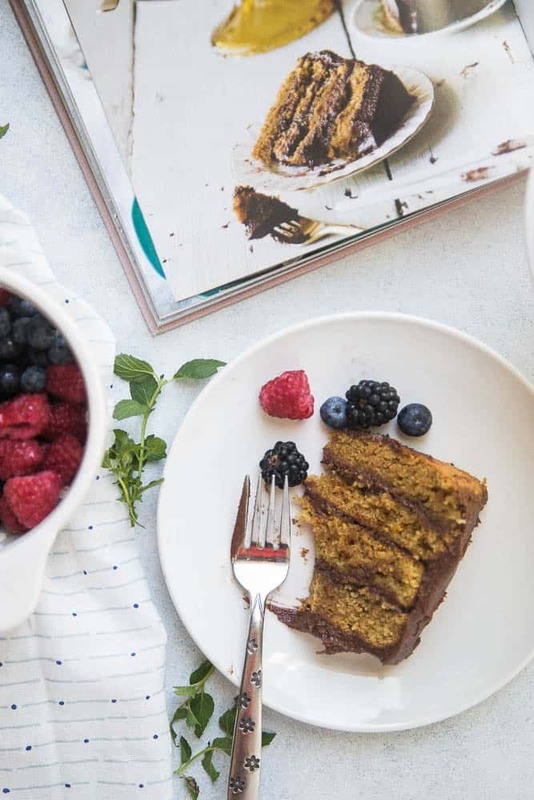 And my mouth is watering like crazy over this cake…one of my favorites from childhood was yellow cake from a box and I’ve been meaning to re-create it using healthier ingredients. 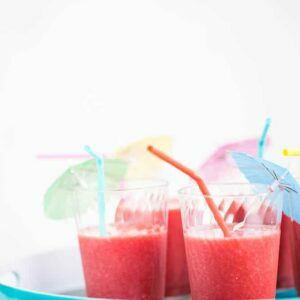 I’ll most definitely need to try this recipe – it looks absolutely perfect! And you did such a marvelous job doing it justice! That yellow box cake is a classic, right? I’m happy to have a cleaned-up version! And thank you!